Rioja is a Spanish wine region famed for its rich spicy, fruity and earthy Red wines, based in part on the Tempranillo grape, whilst white wines rely heavily on the Viura grape. Rioja spans La Rioja, Navarre and the Basque region and wines from this region are legally certified as such. Rioja tends to be red, although white and rose Rioja’s are produced, and is the most sought after wine from Spain. Rioja tends to retail in the middle price range and is increasingly seen on supermarket shelves. It is a strong wine heavy in flavour and whilst not being to everyone’s taste is generally a good buy if it is. 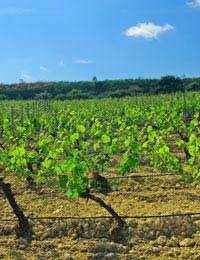 There are few very poor Red Riojas: as with many French wine regions the ‘Rioja’ certification is generally a guarantee that pride has been taken in the wines production. Rioja has steadily increased in popularity in the U.K. over the last twenty years, and is appreciated for its sweet and fruity flavour as well as for its earthy and gritty nature – something in there for everyone! Production of wine in Rioja has been recorded since the late 9th Century, although it is beleived to have started as far back as 900 B.C. under Phoenician influence. Rioja has been legally recognised as a region since 1102 making it one of the great European wine regions. The quality of Rioja wine has been legally protected since 1650, putting paid to the myth that the French are the most conscientious wine producers in the world! Even the local infrastructure in the Rioja region has been fixed over centuries to best benefit wine production: Carriage ways have been redirected and farms have been encouraged to cultivate the best grapes as a matter of regional pride. Although Rioja tends to consist of a high percentage of either Tempranillo or Viura, recent experiments have included a quantity of Merlot or Cabernet Sauvignon, a practice which is legally restricted to just one or two Vineyards. The result is, arguably, a smoother more quaffable wine: The heaviness and strength of Rioja generally mean it is not one for necking at parties! Rioja is classified into four broad categories: Rioja, which is aged for one year or less; Crianza, aged for two years; Rioja Reserva, aged for three years; Rioja Gran Reserva, aged for five years, three of which are in the bottle. The best vintages come along every few years generally, with two happily falling together recently in 2004 and 2005. The youngest wines are often referred to as ‘sin crianza’ (no aging) or ‘joven’ (young wine). They tend to be fresher and lighter. The older wines are more oaky. Rioja goes well with roasted and grilled lamb and even Tagine dishes and Kebabs! A Spanish Cheese such as Manchego or an Italian Parmesan with their sweet flavours are also ideal. Gouda and Edam are also suitable. Its mixture of spice and fruit also make Rioja ideal for a heavy pasta, where it can do battle with dense textures.